Anyone can get started in astronomy, just by going outside on a dark night with a star chart and learning their way around. Timothy Ferris, one of today's most respected astronomers, invites everyone to become a stargazer. Discussing reports from places like the Florida Keys, England and Italy, Ferris tells us what's been seen out there - the Ring nebula, the Silver Coin galaxy, the Virgo supercluster, and how to find them. His devotion to astronomy is clear, and his respect for the universe immense. This work is a starting point for the future of space. Every now and again, I listen to an Audible title that makes me wish I also had the online text or paper hard-copy. This narrative about star-gazing, star-gazers and stars was very well composed, and was pretty inspiring about actually GOING to do the sky-watching. Unfortunately (well, not unfortunately, but disappointingly), the narrative included a HUGE compendium of great ideas and facts, which have proved too hard for me to retain after just hearing them. I really wanted to back up and write down a few of these numbers, analogies and references to the scale of things. My Audible setup and habits make this very hard to do. I wonder if audible might someday enable us to note a portion of a book we're listening to (based on hr:min notation) and request an electronic copy of just the pertinent text for future quotes and reference. There'd be dozens of such citations I wish I could have retained from this book. The work is divided into sections, based on the distance from earth that the observers' are witnessing, and starts with the moon, and actually ends with remote quasars. At each level, there are amazing and admirable folks (might some call them kooks?) who actually contribute and participate in the Real Science of astronomy. Eleven hours is a long audio-book, and I could have done without the long lists of stars and galaxies with particular properties (especially those merely provided a code and number as their name). I do recommend it for an overview of the visual content of the universe. The author is well-known among amateur astronomy fans for his balanced and carefully researched books and articles. In this audiobook, he tells his autobiography and gives personal vignettes involving the people he has known who are amateur and professional astronomers. This first-person treatment keeps the book from becoming dry or overly technical. Understanding the context in which telescopes were built or discoveries made provides an important link between the people and the scientific discoveries they made. His calm voice is ideal for thoughtful listening. I would highly recommend it for someone who can read the popular astronomy magazines but it would be too technical for a person who doesn't have at least a good background in recent scientific discoveries. Very well told, read by the author. Shut your eyes, (if you are not driving) and you will be huddled against the night chill, peering through an eyepiece and listening to one of astonomy's best storytellers. 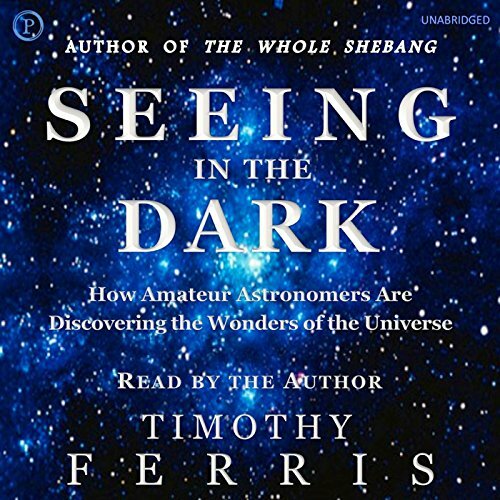 If you lived next door to Timothy Ferris, and went out in your backyard stargazing with him every clear night, this book would be the soundtrack. When you tell someone about a passage of the book, you will almost want to begin the sentence, "I have a friend that is an astronomer, and he told me a story about..." The author's description of an evening with Patrick Moore, is alone, worth the price of admission. If you were thinking, "I'm looking for a good audio book, something I will really enjoy. Maybe want to listen to twice in a row. I wonder what is out there?" Consider this my gift to you. A big fat signpost that reads, "This is it. Start downloading" Prepare for a very enjoyable "listen". You will actually ENJOY commuting to work for the next week or so! Seeing in the Dark has a sprinkling of magic dust for me. I can listen to it again and again and never get tired of the places it takes me. The narrator (and author) has a soothing and kindly voice that immediately puts me in the perfect frame of mind to listen. For anyone with an interest in Astronomy and/or observing through a telescope it is a joy to listen to. I bought this book soon after buying a telescope a year ago. It has kept me company in my journey through the amazing moments, and given me the inspiration to carry on during the times of frustration at telescope failures, bad weather, light pollution and dewey optics. I really enjoyed this book -- the narration was well-done, and the pacing of the book was enjoyable. However, I particularly enjoyed the stories of amateurs making a significant contribution to the knowledge base of astronomy. Inspired me to dust off my telescopes and even to give one to aspiring young astronomers. Love this book; it is presented in a format that you can easily jump to a topic when you are interested in hearing something about it. I let it play in my observatory while observing and have slewed my scope to objects Mr. Ferris is discussing. Very well done. This was my first audiobook choice, and I really enjoyed it. It proved to be a catalyst for my own forays into stargazing, and that alone makes it a very good choice. The book ranges from interesting biographies, to history of discoveries, to a general primer on observational astronomy. The narration might have been better done by a professional, rather than by Ferris himself. But the fact that he is an astronomer gives his story telling a certain intimacy that someone reading a script might not have. I will definitely be listening to this one again. Would you consider the audio edition of Seeing in the Dark to be better than the print version? I enjoy listening to Timothy Ferris. His gentle voice and poetic approach to science is both calming and educational. I particularly enjoyed his highlights of deep space objects and stars visible from Earth. I have listened to this section over and over and used it in my own stargazing. I was moved by his beautifully poetic descriptions of astronomy. As he described it himself, it is a "narrative" more than a science book. But his work is grounded in the science. It almost feels like a "love story." I have enjoyed Timothy Ferris' work ever since I first saw his PBS Special "The Creation Of The Universe." This isn't a textbook about astronomy, but rather a long look at various aspects of the hobby and the profession as told by a long time practitioner. For anyone that has enjoyed the hobby, particularly if you grew up in the days of the space race and were pulled in, you'll like this book. You'll hear stories ranging from Clyde Tombaugh discovering Pluto, to a discussion with Stephen James O'Meara discoveries, to robotic telescopes. I've listened to this book three times since getting it last month and have enjoyed it each time. If you could sum up Seeing in the Dark in three words, what would they be? What about Timothy Ferris’s performance did you like? No - it would be a long single sitting story.